Helping those already familiar with agriculture is only part of Richard and Saralee’s legacy. They wanted to teach those who had never raised an animal or grown their own food what it was all about. Their desire culminated in the Sweet Lil’s Farmery, named after Saralee’s mother, where both parents and children can learn the basics of agriculture. At Sweet Lil’s, you’ll find faux cow “milking”, baby chicks hatching and a host of other ag-tivities. Drive a tractor, venture into the hay maze, or visit the little pigs in their straw, wood and brick houses. Get in on the buzz with beekeepers and learn how important our pollinators are for farming. There are corn boxes and a chance to visit baby farm animals and their mothers. It’s a special place to learn, play and be down home on the farm. For more information on Saralee & Richard' Barn visit our Fair Foundation page. The Barnyard Stage is the place to be for all day fun jam packed with contest for all ages and special performances! For those who want to get even closer to the animals, the Great American Petting Zoo is open from 11:00 am to 8:00 pm daily during Fair. Where else can you pet a deer, get nuzzled by a Pygmy goat or licked by a llama? 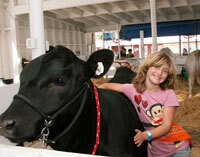 Enjoy touching and feeding the animals every day at the Great American Petting Zoo. The zoo contains a wide variety of animals including llamas, Fallow Deer, African Pygmy Goats, assorted exotic and domestic goats and sheep, Vietnamese Potbellied Pigs, Bantam Chickens, miniature Sicilian Donkeys, miniature Call Ducks, and baby animals born all year long. Ours is a very different kind of petting zoo. Fairgoers love the Milk Barn at the Sonoma County Fair, where they can watch cows being milked and learn about Sonoma County's famous dairy industry, known for innovation and leadership in producing some of the highest quality products anywhere in the world. Be sure and stop by the barn as you stroll about the grounds. A Fair favorite is the Cattle Barns, which house both Dairy Cows and Beef Cattle during the livestock competitions. Did you know cows spend 6 hours eating and 8 hours chewing their cud every day and a dairy cow can produce 6-8 gallons of milk a day . These are just a few fun facts discovered when you visit the barns at the Sonoma County Fair. Showing sheep and goats at the Sonoma County Fair is a fun and educational experience for all. Did you know that both sheep and goats have 32 teeth, but neither have upper front teeth. 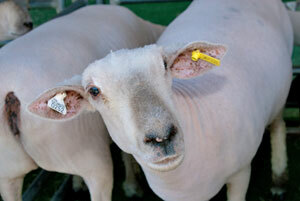 Explore the sheep and goat barns every day to disover fun new facts. More than just chickens and bunnies, this barn is home to more varieties than any other. 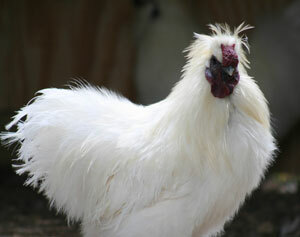 Fairgoers are invited to see Geese, Cavies (Guinea Pigs), Rabbits, Ducks, Turkeys, Chickens and all kinds of other birds. (Be sure to check the schedule as the animals are not all here at the same time). For young farmers, it is a pleasure to drive a well-trained and groomed pig into a show ring. Every day the pigs on display during the Fair are cared for in preparation for their big debut. 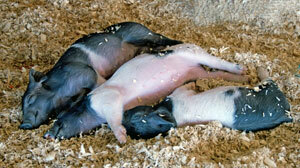 Meander the Swine Barns and discover all the shapes and sizes of this year's competing pigs.